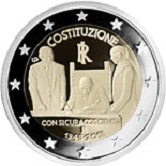 The coin commemorates the 70th anniversary of Italian Constitution. The motif shows Enrico De Nicola, the provisional Head of State, signing the act of promulgation of the Constitution of the Italian Republic on December 27, 1947. On the left is Umberto Terracini, President of the Italian Constituent Assembly. On the right is the Prime Minister Alcide De Gasperi. Above, running from eleven to one o’clock is the inscription “COSTITUZIONE” (Constitution) and immediately thereunder is the country designation – an I superimposed on an R.
Under the signing table is the inscription: "CON SICURA COSCIENZA" (with confidence), thereunder the mint mark ”R” and under that “1948 • 2018" the year when the Italian Constitution came into force and the year of issue of the coin. Finally, at the o’clock is the mark of the designer Uliana Pernazza.